Lipreading Mom is a movie fan—when those movies are captioned. 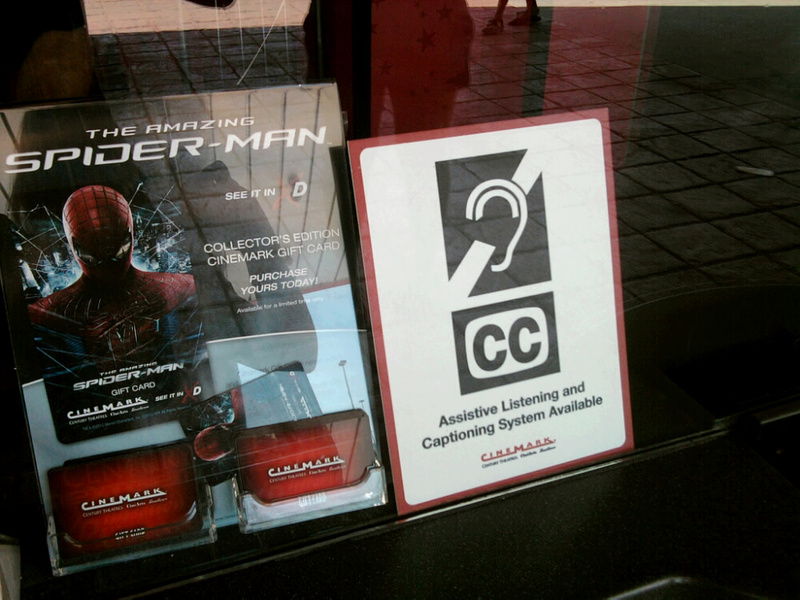 This is the beginning of my ongoing series about movie accessibility via captioning. Join me in the coming weeks as I interview captioning advocates from around the world, including the founders of Collaboration for Communication Access via Captioning (CCAC), CaptionFish.com, and yourlocalcinema.com. Today’s interview is with Attorney John Waldo, Advocacy Director and Counsel for Washington State Communication Access Project (Wash-CAP), and Counsel for the Oregon Communication Access Project (OR-CAP). Once upon a time, American theaters showed few captioned movies. There were two choices: open captions with words directly on the big screen, and rear window (closed) captioning with a reflective cup holder captioning device. Then U.S. theaters acquired state-of-the-art digital projection, replacing the age-old reel-to-reel system. Movie companies and theaters now had the means to caption the digital films using various portable (closed captioning) devices. Open captioned showings became less and less as a result. Why the backlash against open captioning? Recently, Lipreading Mom saw as many captioned Oscar-nominated films as possible. Two captioning options were available, depending on the theater location: Doremi CaptiView and Sony Entertainment Access Glasses. More theaters are utilizing CaptiView technology than any other captioning sources. AMC and Cinemark are among the national chains who now embrace CaptiView. 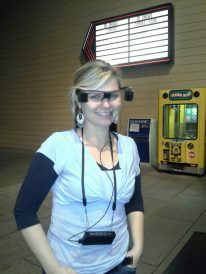 The other type of device, Sony Entertainment Access Captioning Glasses, is eye ware that fits over regular glasses and displays the wirelessly transmitted captions onto the glass lens. Waldo admits that neither device is perfect. “Some viewers find CaptiView uncomfortable, especially over a long movie, because of the need to glance back and forth from the device to the screen. That problem seems particularly noticeable to patrons who are totally deaf, and must read every word, but is less of a concern to hard-of-hearing viewers that may be able to discern some of what is said, and glance only occasionally at the viewing device. Before CaptiView and captioning glasses, rear window captioning (RWC) was the only portable accessibility option. But this product has become virtually obsolete in American cineplexes. Waldo thinks this is unfortunate. What Happened to Open Captioning? Some hearing loss community advocates have a strong dislike for portable captioning. They will only attend a movie if it is open captioned (OC). In the next LipreadingMom.com post about captioning, Waldo will shed light on how American law, including the Americans with Disabilities Act, has influenced cinema accessibility choices today. Comment below with any questions or insight about the topic of captioning. Whilst we are lucky enough to have open captions cinema screenings in the UK, I know that trials are about to start for other options for which I hope to take part. I’m not sure how I feel about it yet, trying not to judge before I’ve tried the other options other than open captions. @iheartsubtitles – Be sure to watch my blog in the next week or so for a “Captioning Goes to Court” interview with Derek of yourlocalcinema.com about movie captioning in the UK. 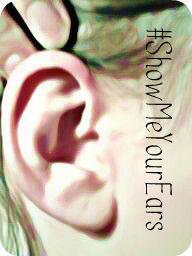 @accuratehearingcenters – Thanks so much for the reblog! A big THANK YOU to our own John Waldo for advancing access via captions in our theaters!! Did you know you can request a neckloop to use with the Theater’s Assistive Listening System ? 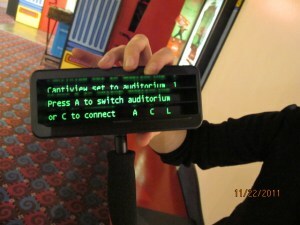 Show your Thanks to John and the theaters by requesting assistive technology. Let’s all go to the movies! Cheri – Yes, a big thank you to John and all advocates, not only for captioning inclusion, but access to assistive technology and looping. I am a big fan of the Let’s Loop Seattle initiative and appreciate your hard work. Reblogging on Let’s Loop Seattle. If its known how uncomfortable the glasses are to wear then what is being done to address that issue physically and legally? I would say that consumers can go directly to the Sony Entertainment Access Glasses website to post their concerns about the product. Hopefully more captioning advocates, like John Waldo, will also contact Sony. William – Thanks for keeping us posted. I have a slight hearing loss, and so I often turn on closed captions or subtitles when watching TV or DVDs so I can get all the dialog. Half of my family finds the captions distracting, which lessens their enjoyment of the show. One of my daughters specifically has a different disability that makes watching a captioned movie virtually impossible. Thus I can understand the reticence of theaters to use open captioning. Unless the video is being specifically targeted for hearing-impaired individuals, closed captioning is a going to be a better choice. The theaters near my home don’t have any sort of closed captioning devices or any open captioned showings. My father and I often go to the movies together and he always interrupts my viewing to ask me what the character says but I also don’t know! And then because he interrupts me, we both miss the next scene. I manage to get along in movie theaters by watching the action and trying to figure out what is going on by the body language of the actors. After reading this blog by Lipreading Mom, I’m tempted to confront my local theaters about their lack of support for those who are hard of hearing. I don’t see why they wouldn’t spend a little extra to make more and more customers come and enjoy their movies that otherwise couldn’t.